Basically, what Mr. Erdogan says is that since the ten largest global economies do not want Turkey to be on the list, they conspired to suppress Turkey’s growth by breeding violence in the one of the most peaceful countries in the world. President Erdogan believes that Turkey as any other Muslim country should have the same rights as the alleged global conspirators—five permanent members of the UN Security Council. We shall not be too critical of the fact that Erdogan classified China, a permanent member of the United Nations Security Council, as a Christian country. Though it could be possible that Christianity is somewhat spreading in this country, it was not on the news reports that the Communist party of China decided to make Christianity the country’s official religion. What else would President Erdogan change for the world to become a more just place (in his opinion)? Maybe he would grant all 193 member states of UN the status of permanent members of the UN Security Council with the right to veto? Obviously, it would not be too practical. Maybe he would stipulate for each monotheistic religion to be represented in the UN Security Council? Does it mean that Erdogan would want Israel to also be a permanent member of the Council? What about atheists? What country should represent them in the Council China or the People’s Democratic Republic of Korea? India with its Hinduism and Japan as a country practicing Shintoism would have to be included in the composition of the overhauled Council. However, the task of selecting a Muslim country for the Council could turn out to be a more problematic issue than Erdogan naively believes. First of all, which Islamic school of thought should be given the priority? If, for example, it happens to be a country practicing Sunnism, would it mean that Erdogan’s call for all religions to be represented in the UN Security Council remained unfulfilled? Thus, it could be Iran and a permanent representative of Sunnis. But what Sunni country should have the privilege to represent the Sunni branch of Islam? 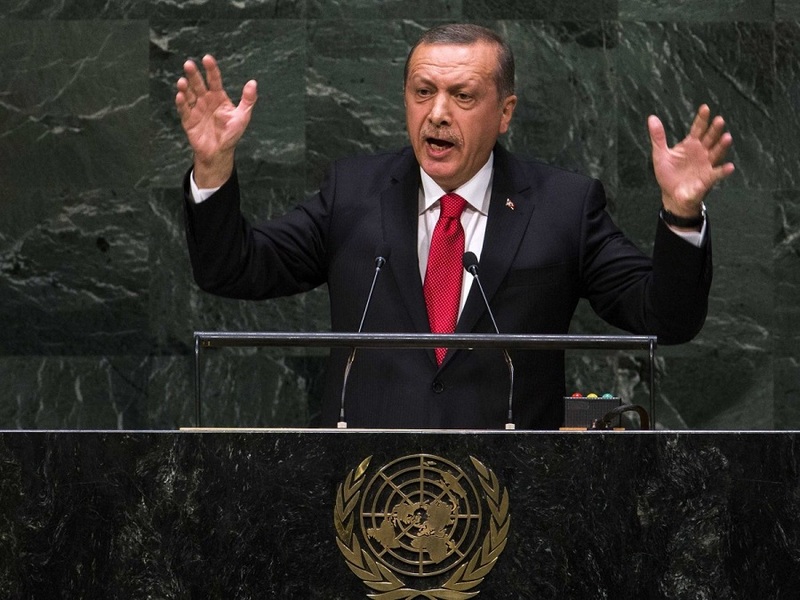 It is not difficult to imagine what country Erdogan sees as an ideal candidate for the UN Security Council member. But what criteria should be used to determine the most suitable candidate? What country should be considered “the most Sunni country in the world”? How can the selection procedure be streamlined? One of the most commonsensical candidates for the membership would be Saudi Arabia as the country-guardian of the most valuable shrines of Islam. It would be curious to see how Saudi Arabia, Iran and Israel would peacefully negotiate issues as members of the Council. Another criterion for choosing a country for the Council could be the highest number of Muslims. But if this criterion is applied, Turkey will be surpassed by Indonesia, Pakistan and even Egypt. Besides, since the Muslim community of India is twice as large as the entire population of Turkey, this country would have better chances of been elected to the Security Council. Erdogan is complaining that all five members of the United Nations Security Council are Christian. But if to follow the religious principle when shaping the Security Council, not only Sunnis and Shiites would have to be represented in it, but also all Christian denominations: Catholic, Eastern Orthodox, Protestant, etc. And what about animistic cults practiced in Africa, or Zoroastrians, whom Erdogan openly scorns? In the end, do we need to have a body maintaining peace and security in the world or a global congress of religious devotees that would also include atheists?